By car from Chippenham or Bath: follow the A 4(T) to the Corston roundabout, and follow the A 39 towards Marksbury, but take the minor road left at the Stantonbury Public House. Youll pass Stantonbury to your right, and cross Wansdyke at the second track right. Continue on to Stanton Prior, where you go left to Wilmington, but go left at the crossroads down the valley. A short way before Park Farm a trackway goes left, which leads to Wansdyke. By car from Bristol: follow the A 4(T) to the Corston roundabout, and then continue as described above. From Weston-super-Mare and the M5, follow the A 371 to Bristol and the A 368, all the way to Marksbury, there go right to Stanton Prior, and continue as described above. From Shepton Mallet: follow the A37 to Bristol. 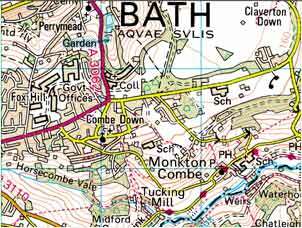 Take the A 368 right to Bath, and after Marksbury, there go right to Stanton Prior, and continue as described above. From Frome: follow the A 362 to Radstock and beyond to Farrington Gurney, where you join the A 37 and continue as described above. After it leaves the hillfort of Stantonbury, Wansdyke runs across the fields towards Corston Brook. Most of that stretch, it is obliterated by agriculture, but due east of the stream it can be seen again, running toward Park Farm. This wa once an important Ridgeway (the name Herepath means so much as 'Armies' Way'), which called for blocking. Between Park and Pennsylvania Farms, nothing is found. By car from the directions of Chippenham, Bath or Bristol. From Chippenham or Bath: follow the follow the A 367, which is the Roman road which is called the Fosse Way, to the Hospital roundabout. 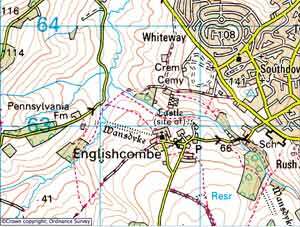 There go right to Rush Hill and Englishcombe, until you reach the road left to Englishcombe village. Drive up the hill and right into the village. Wansdyke is situated at the back of the church, from where a footpath also leads to Pennsylvania Farm, passing Wansdyke on the north side. From Bristol: follow the A 367 to the Corston roundabout, and follow the road through Newton St Loe and Padley Bottom, until you reach the road left to Englishcombe village. Then continue as described above. By car from the directions of Bradford-on Avon or Trowbridge. By car from the directions of Shepton Mallet or Frome. From Shepton Mallet: follow the A37 to Bristol, and then the A 367 to Bath. When you arrive at the Hospital roundabout, continue as described above. From Frome: follow the A 362 to Radstock and the A 367 beyond to the Hospital roundabout, then continue as described above. By car from Weston super Mare, follow the A 368 all the way to Marksbury, then follow the A 39 to the the Corston roundabout, and follow the road through Newton St Loe and Padley Bottom, until you reach the road left to Englishcombe village. Then continue as described above. Wansdyke is best seen near Manor Farm, Englishcombe. This is a very good spot to visit, for the large bank is very visible here. The ditch has completely silted up, however, but that does not diminish the apparent former grandure. East of Englishcombe, nothing of Wansdyke can be found until it leaves Breach Wood, high above Padley Bottom. From Bath: follow the follow the A 367, which is the Roman road which is called the Fosse Way, to the Hospital roundabout. There drive on to the next roundabout on the A 367 (Odd Down roundabout), where you can park the car (signposted). There take the first road left, from where a path leads into Vernham Wood. From Bristol:follow the A 367 to the Corston roundabout, and follow the road through Newton St Loe and Padley Bottom, until you reach the Hospital roundabout. Then continue as described above. From Shepton Mallet: follow the A37 to Bristol, and then the A 367 to Bath. When you arrive at the first roundabout (Odd Down roundabout), continue as described above. From Frome: follow the A 362 to Radstock and the A 367 beyond to to Bath. When you arrive at the first roundabout (Odd Down roundabout), continue as described above. By car from Weston super Mare, follow the A 368 all the way to Marksbury, then follow the A 39 to the the Corston roundabout, and follow the road through Newton St Loe and Padley Bottom, until you reach the Hospital roundabout. Then continue as described above. Alternatively, before you reach Marksbury take the A 39 to Farmborough, there take the minor road to Timsbury, where you take the B 3115 to Bath. After joining the A 367, continue as described above. 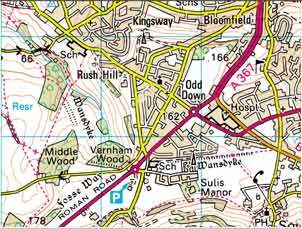 After emerging from Breach Wood, Wansdyke runs almost dead south, until it makes a sharp turn back east before entering Varnham Wood. Though there are steep banks here, they are not reckoned to be part of Wansdyke, which only emerges again east of the Fosse Way (A 367), where it crosses Odd Down in an almost straight line. Wansdyke ends at Cross Keys, which is the start of the Horsecombe Vale. From Bath: follow the follow the A 367, which is the Roman road which is called the Fosse Way, to the Hospital roundabout. There take the B 3110 to Hinton Charterhouse, but park the car at Cross Keys. A footpath will take you west along Wansdyke for about half its stretch across Odd Down. From Shepton Mallet, follow the A37 to Bristol, and then the A 367 to Bath. When you arrive at the Hospital roundabout, continue as described above. From Frome, follow the A 362 to Radstock and the A 367 beyond to to Bath. When you arrive at the Hospital roundabout, continue as described above. Alternatively, before you reach Marksbury take the A 39 to Farmborough, there take the minor road to Timsbury, where you take the B 3115 to Bath. After joining the A 367, continue until you reach the Hospital roundabout, then continue as described above. After ending in the Horsecombe brook, the line defended by Wansdyke follows the steep south bank of the Vale, then following that of the Midford Brook, until it ends in the Avon river just east of Monkton Combe. Today, it is not thought that Wansdyke had anything to do with Bathampton Down. 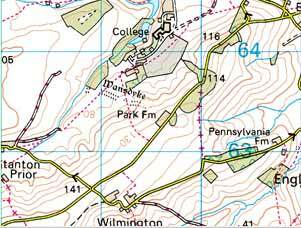 click here to return to West Wansdyke, section 4.